Where can you find Ole South? Ole South is carried across the United States by many large and small stores and pharmacies. Click here to find out a location near you! "I spent over $4000 in five years with three GP's and two dermatologist on a rash in the palm of my hands. After only one week of your ointment, my hands were better than they have been in five years. Wish I had known about it $4000 ago." "My husband avoided hemorrhoid surgery after using Ole South Ointment for only one week." A formula tested, tried and true, look for that bright yellow label anytime you are facing a skin issue. Each jar contains a formula used for nearly 100 years by families all over the south. 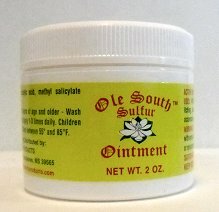 What are the common uses for Ole South Ointment? Some customers say they haven't found anything Ole South wont take care of. We have found it's commonly most effective in the treatment of psoriasis, ring worm, dry cracked feet, hemorrhoids, athletes foot, jock itch, insect bites, poison ivy, oak and sumac, rashes and other skin irritations. Ole South Ointment is 1 product you always keep on hand, save hundreds a year by keeping a jar of Ole South around to treat whatever comes your families way. So get your jar of Ole South today!